This article was created by Monique Steele and was published in The Press and Stuff News (Fairfax Media) on 17/11/2017. 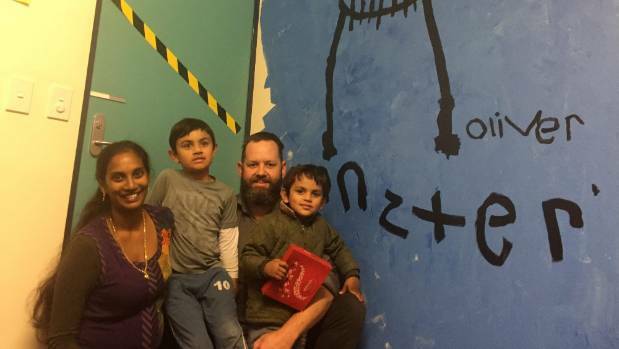 The walls of a Christchurch building fated for demolition have been transformed into a living art exhibition. Local artists used the walls of the Presbyterian Support Services building on Bealey Ave as the canvas for displaying their unique artworks. 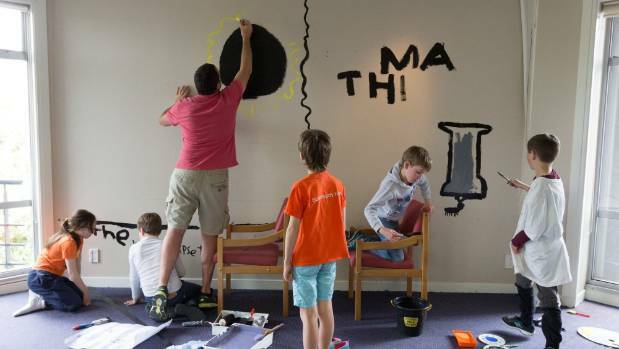 Artists from across the city took part in the project at the earthquake-damaged building, ranging in age from 5 to 65. Ten-year-old Hugo Fischer was thrilled to finally do his spray paint art in a public space rather than just in his backyard. 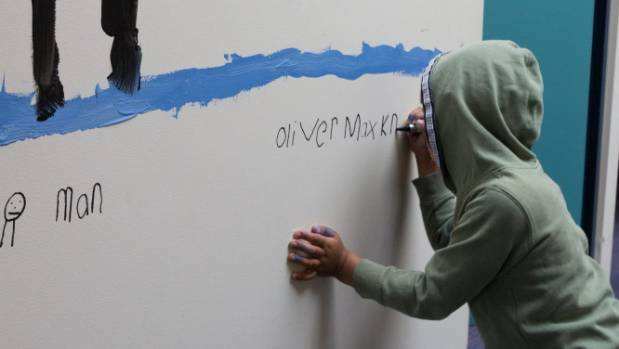 His design – a large spray can spraying words including love, hope, strong and connected – filled an empty room in the condemned building. 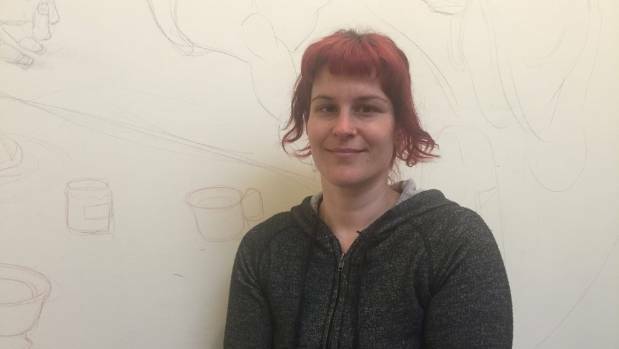 “The opportunity to have a free space to do something is huge,” mum Sarah Fischer said. 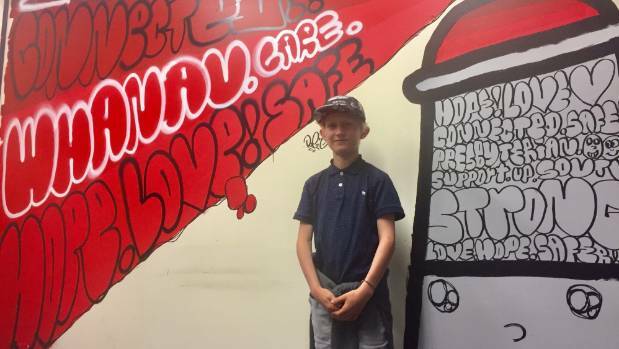 Hugo said when he was older, he wanted to create murals around the city, just like his favourite local street artist Jacob Yikes. 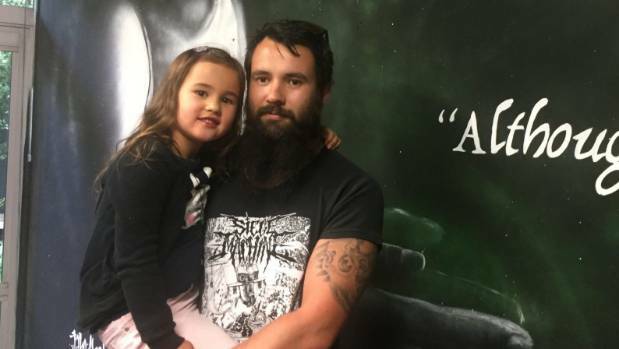 Clark, a screen printer and graphic artist by trade, was inspired by his daughter, completing her mural and a large, colourful eyeball on a neighbouring wall. 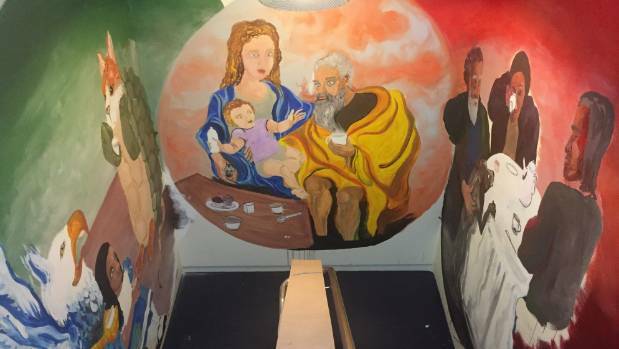 Second-year art student at Ara Institute of Canterbury Madeline Thompson used a tight stairwell as the canvas for her three-wall mural Tea Time, depicting the power of social interaction over a cup of tea. Photographs of the finished artworks will be collated into a Presbyterian Support Upper South Island (PSUSI) 2018 calendar before the building is demolished in the coming weeks. The project was the group’s way of honouring more than 100 years of social service in New Zealand, based at the Bealey Ave premises for the last 24 years. Chief executive Vaughn Milner said it was “a bit sad” to lose the building, which was filled with memories for his staff of 45. PSUSI supported children, youth, older people and families from Nelson, Marlborough, West Coast, North and Mid Canterbury, and Christchurch communities with services including social work, counselling, programmes for the elderly and community initiatives. In 2016-17, more than 7200 clients used 66 PSUSI services through the 10 regional or satellite service centres throughout the upper South Island. The exhibition was open to the public on Saturday 18th November from 10am to 4pm at 44 Bealey Ave. If you would like to purchase a wall calendar created with artwork from the exhibition, click here. To find out where Presbyterian Support’s main Christchurch office has shifted to, click here. To read more about what Presbyterian Support does and the services PS provides, click here.